Graham Slee Voyager review | What Hi-Fi? You don't tend to think about headphone amplifiers being the most portable of objects, but with the Voyager, Graham Slee is challenging that view. 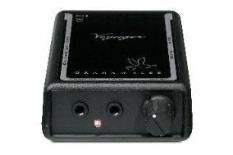 Working off either mains or battery power, the Voyager is a solidly built, fairly slim plastic box, with a volume control knob, line in and headphone sockets, power source selector switch and tone contour switch. Graham Slee says the Voyager is ideal as an iPod accessory, but while it does improve the sound, it's hard to imagine using it on the move due to the unit's bulk and extra cabling involved. Where the Voyager really shines as a concept is as an accessory to items such as laptops and well, pretty much anything else with a headphone socket, although you'd need good quality headphones to get the best result. Plugged in, you get a full-bodied, solid sound that's well balanced and packed with detail. The tone contour switch adds brashness to the top-end when on 'contour' and makes for a wearing listen.